Aaron Leonard is a freelance journalist. His columns and interviews span the gamut from geopolitics to economics to religion. He is a regular contributor to the History New Network and other publications. His writings can be found at www.aaronleonard.net. Bertell Ollman is a Marxist scholar and professor of politics at New York University. His work is a canny mix of serious scholarship and novel popularization through such books as Dance of the Dialectic: Steps in Marx’s Method, and How to Take An Exam...and Remake the World. He made a famous appearance on Hannity & Colmes in 2006 (still available through the miracle of YouTube). On the show, Sean Hannity challenged Ollman for giving him a C+ -- his worst grade in college. As things turned out both men were mistaken. As Ollman told me, Hannity’s actual professor was Mark Roelofs. Ollman explained that, had he been Hannity’s teacher, he would have failed him outright. He is perhaps best known for developing the board game Class Struggle, which went on to sell 250,000 copies worldwide. In the aftermath of the financial crisis, there has been much debate on the state of capitalism -- significantly Marx’s Capital had a surge in sales worldwide in the wake the crisis. In that context, what people like Ollman have to say is of particular interest. I sat down with him in his office on the NYU campus to discuss his life, his forthcoming book of Marx’s writing on economic crisis, the continuing relevance of Marxism, and the prospects of the communist future Marx anticipated. How did this idea for this latest book come about? Before the current economic crisis hit I had collected about two hundred pages of Marx’s writings drawn from the period of the mid-1850s and 1860s, when he was focused on capitalist political economy. This was the period when he was preparing to write Capital. I was only going to have about ten pages of this five-hundred-page book devoted to the crisis; thinking that, because of its importance, someone must have brought this together in one book. I found that there wasn’t. Most of that work appears in unpublished writings and a lot of it is unfinished. It appears in different language -- some very dense, some very simple. The question I asked myself: was it possible, through some very heavy editing, to make this into a cohesive work? I like to think the way I edited it is how he would have edited it. It is a very dialectical editing. These pieces do hang together this way. The interconnection between the elements is important. Not just in his economic theory, but the dialectic between that theory, and let’s say his views on communism -- which is a potential within capitalism. The evidence of that in his writings comes in places where he’s criticizing capitalism -- there are asides of what things could be like under different conditions. So I’ve taken them out and treated them separately in a chapter. There’s also a long chapter on ideology and one on revolution. These things probably wouldn’t appear in a book on crisis if I was in an economics department, if I was not as concerned with dialectics and the interconnections. Marx tried to bring out the whole of capitalist civilization as thoroughly interconnected in its various parts. I’m trying to bring that out in this book from the vantage point of his theory of crisis – emphasizing, to be sure, the more narrow economic aspects of the crisis. But all these other things are part of the larger theory of crisis as I understand it. That’s the book which is almost ready. How did you become a Marxist? It’s Marx himself. I began my political life as a liberal democrat at University of Wisconsin. I was very critical of communism and of Marxism. In Madison I did an M.A. thesis on the hostile criticisms of Marx from the beginning to start of the Second World War in the English language. I thought I really understood Marx cold and was absolutely certain of him being very, very wrong. Except... I wasn’t too sure what he actually said. This was a very awkward position to be in. Then I went to Oxford, where I had friends who were Marxists of different kinds, some of whom were communists. They were very impressed at how much I knew of the anti-Marxist literature, but they really drove the point home that I couldn’t know so much about why Marx was wrong and so little about what he actually said. My initial title for my doctoral thesis was “Marx’s Conception of Human Nature and it Influence on Soviet Ideology.” I then began reading Marx seriously. As it turned out, I spent two years reading practically nothing else. In the course of this reading I had a strange experience again and again. Just before I was about to turn over a page in any important writing by Marx, I knew before I turned the page that what Marx was about to say was going to be wrong. I would hit him with half a dozen criticisms. Then I would turn the page and he never said quite what I was criticizing him for. He said something which was different. It not only confused me, but made me very angry at Marx. Why was he doing this to me? Little by little, I came to see that he was right. Little by little, I came to agree with him -- I can’t say struggling and screaming all the way -- but I did know that becoming a Marxist was not the way to glory, fame, and fortune in the United States, or any other Western economy. This is where I’ve been ever since, elaborating on that understanding and using it to analyze a variety of subjects. So it changed your life. Yes, but I also got an Oxford degree in the process, which was kind of a hot item to get and made it relatively easy to get jobs, especially since I worked with Isaiah Berlin in Oxford, considered by many to be THE major liberal thinker of the twentieth century, someone who had a lot of influence on political theory throughout the English-speaking world. Despite my trying for years to convince him about how Marx was right, he never really agreed with me, but we gained great respect and affection for each other. He and the Oxford degree were crucial for me getting jobs even though I held, and still hold, views that most of academia not only didn’t like, but actively rejected. 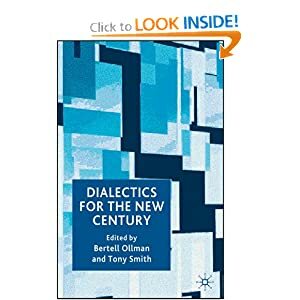 Dialectics has gotten a bad rap because of the mechanical way it has been interpreted. People like Stalin used it as something akin to crystal ball, a method for predicting an inevitably wonderful classless future. The reality has been quite different. You’ve written quite widely on this philosophical method. Why should we think “dialectically” instead of just relying on common sense? Because the world is dialectical, and common sense is only occasionally dialectical. No one is going to deny that everything is in motion and changing in one way or another and at one speed or another -- that’s commonsensical. Nor is anyone going to deny that everything in the natural world -- as well as the social world -- is interconnected one way or another and these connections are going every which way between the elements of the world. That’s where to start, but it doesn’t follow that the effects are of equal importance. It doesn’t follow that they deserve equal amounts of attention. That can only be decided by doing research, to see what’s happening. It is good to begin with this insight, a very common one, but very little is made of it in the way people actually think, or treat in their studies or research. The reason is that it’s very hard to control this. Can you actually find the way to keep from getting overcome by all of the complexity? If you take it seriously, how can you not be hit with a tsunami? Better we shouldn’t start. The same thing is true with the idea that once you understand things in terms of processes that have come from somewhere, gone through stages, arrived in the present, and are moving in a future direction. Common sense is partially dialectical in that it is an attempt to deal with history and interactions, but it doesn’t have a full framework in which to do this. It has no way to draw boundaries. The problem for dialectical thinkers is akin to eating a steak that is too big to fit in your mouth at one time. You have to cut off a piece that will fit. When you think about a problem, you have to cut off a piece to get it into your head. You’ve got to think about it without losing the insight that came come at the expense of a larger context, which is also -- potentially anyway -- very important. Following that methodology, what does Marx have to say about analyzing the economy that is different than most economists of today? Mainstream economics is mainly about what happens in the marketplace. Everybody knows how the marketplace works. What Marx called the mode of production consists of four interrelated processes: production, distribution, exchange, and consumption. Since they’re all interrelated, it is possible to start with any one of them and work your way through the interconnections and bring out what’s important to the whole mode of production, but where you start has a strong influence on what you come out with. Mainstream economists emphasize what’s happening in the economy from the vantage place of what’s happening in the marketplace. They also talk about the importance of money, especially since finance capital has become the dominant form [of capital]. Capital is broken up to three sections by Marx: industrial, financial, and commercial. For the longest time, industrial capital was really in the driver’s seat. Over time -- for reasons we can’t go into here -- the capitalist class in finance has become the most powerful of the class. So the financial arm of General Motors was making more -- I don’t know if it’s still the case -- than the industrial arm of General Motors. In that situation, what’s going on in production doesn’t get studied as much; its relationship is treated only in terms of what kinds of orders come in, etc. In fact, it’s the most important place to begin. This is what Marx does -- and this is the biggest difference from mainstream economists. He starts with and emphasizes what goes on in production. But we aren’t that focused on classes in the United States, and not too many people talk about or even acknowledge a capitalist class. Who has trouble in talking about serfs and aristocratic landlords in trying to understand feudalism? When we talk about slave societies, who has difficulty starting with and emphasizing the relationship between the slave owner and the slave? Not just for how things get produced, but for the other conditions and qualities, political and cultural in those societies. We come to capitalism and all of a sudden that’s a Marxist position. Emphasizing those who produce wealth and those who control the means of production in capitalism is all of a sudden Marxist. It becomes dangerous, then, because we still have that system. Capitalism, it turns out, is much less transparent. The wealth that has been obtained has been used to create a cocoon of institutions that mystify what is going on. In feudalism or slavery, people who produced the real goods are not as confused about what is happening. The serf knows that he has to give certain share of his product to the landlord. The slave has no trouble understanding what his relationship is with the slave owner. Is this Marxist notion of communism still at all valid? I view history inside a very big picture. I start way back in terms of trying to figure out how we got here, what’s happening now and projecting the possibilities of where we might go. Capitalism is also creating conditions that make possible a huge turn in history -- if we’re lucky -- somewhere up ahead. If we get our act together -- that is the non-capitalist part of the population -- if we take political power away from the capitalist class and use what they’ve created in the way of industry, science, the more democratic parts of the so-called democratic society we have and many of the ideas, like liberty and equality which have been given a capitalist twist -- it is also possible to see socialist, a humanist twist on those ideas. Also inherent is the human personality -- people have an enormous amount of potential for cooperation, for creativity, for being kind, which is only tapped here and there because in their lives they have to fight like cats and dogs just to survive. I’m not as optimistic as Marx was back in the late nineteenth century. So much has happened that makes that kind of optimism naive. But I think the basic analysis he makes is still relevant, how he sets up the problem, and the possibilities he points to as inherent in the conditions of capitalism -- the seeds of communism he sees.